A select group of students on campus want to be judged by their appearance. They’re usually just wearing t-shirts and jeans, or even sweats, but they walk with the confidence of someone dressed to the nines. They are intramural champions, and that t-shirt is a badge of honor. When athletes win the championships of any intramural sport, the t-shirt is the only prize, but it’s plenty. The intramural shirt has been a symbol of the championship, talent and hard work for more than 30 years. The symbolism has elevated a basic t-shirt to legendary status. 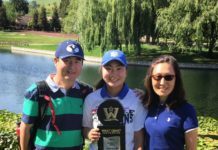 BYU graduate Kaitlin Farmer still participates in intramural sports, and although she’s never won a shirt, she understands its reputation and powerful effect. To people unaffiliated with intramurals, all championships are created equal because there’s only one t-shirt design per year for all the sports. Still, some sports, like basketball and flag football, are more difficult to win because they attract more participants. Farmer said winning a shirt for these sports is more prestigious, but only to other intramural athletes who understand the level of play. 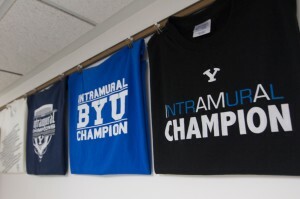 The purpose of BYU intramurals, according to the official website is “to provide all with a wholesome recreational experience” and “to serve the recreational needs of the majority of the student body.” Fierce competition runs high despite this intent, and a championship isn’t just a game to those involved. Jarom Jordan has won two championship t-shirts while participating in intramurals. Jordan has competed for more than eight years, some as a student and some as an employee at BYU Broadcasting. Jordan explained that competition gets heated, especially in flag football. He shared an experience in which a flag football player received his second yellow card, an action that would normally get him kicked out of the game. Unwilling to walk away, he gave another teammate’s name instead of his own and kept playing. Manti Su’a didn’t really believe in the importance of intramurals when he transferred to BYU from Utah State in 2005. As a former All-American rugby player he thought students’ idolization of the shirt was corny and over the top. “I thought if you were really good at football, you’d be on the football team, not playing intramurals,” Su’a said. Su’a’s opinion changed when he won his first football championship. 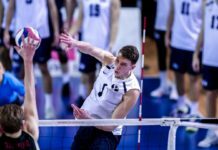 Originally his team just showed up for the fun of the game, but by the end of the season the players were drawing up plays and incorporating rugby moves to outplay their opponents. Su’a recalled one year when the two semifinals for football were scheduled on the same night. The winning teams from both games were too excited to wait another week for the scheduled championship. Su’a and the other athletes competing in the finals convinced the referees to stick around and hold the championship that night. Su’a’s team won twice that night and walked away one t-shirt richer. Phil Kelly has worked intramurals for more than 25 years and now serves as the director of Intramural Activities. His experience taught him just how seriously the participants treat the competition. “I’m not oblivious to the fact that for a lot of people it’s a pretty big deal to get one of those shirts before you graduate,” Kelly said. The championship t-shirt wasn’t always the only prize, Kelly said. In the early 1980s, the intramural office experimented with other types of awards like water bottles and gym bags, but people were happiest with the shirt. Once there was even a competition to design the t-shirt. Kelly said that up until about 2009, there was a shirt design contest for students with a cash prize, but it was discontinued when the designs became repetitive and stale in originality. Now the shirt is designed by someone within the department, because according to Kelly, all you need is a BYU logo and the words “intramural champions” and people will wear it with pride. Brooke Adams is a sophomore from El Segundo, California, studying public relations.